The Western Front in World War One is considered a a war of outdated tactics combined with brutal efficiency of technology. And while the war saw the introduction of several innovations (eg. tanks and airplanes) the general routine of heavy artillery bombardments followed by men “going over the top” to meet barbed wire and an entrenched enemy remained the defining (and very much repeated) way to fight in this war. Within this set tactics, were there advancements made in terms of fighting capability throughout the war? In this post I’ll develop a hierarchical model to observe the battle exchange rate at a particular point in time. 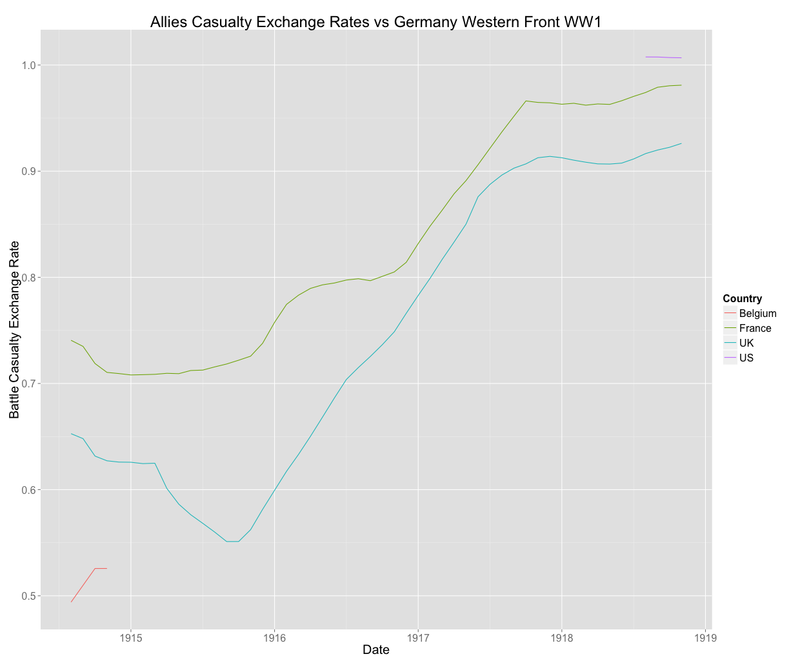 A battle exchange rate is ratio of casualty statistics for a particular country/battle. There were of course many advancements to tactics throughout the war. Whether these had any effect is unsure. I figure if we can see changes in battle exchange rates throughout time then we can conclude that changes in tactics had an effect. 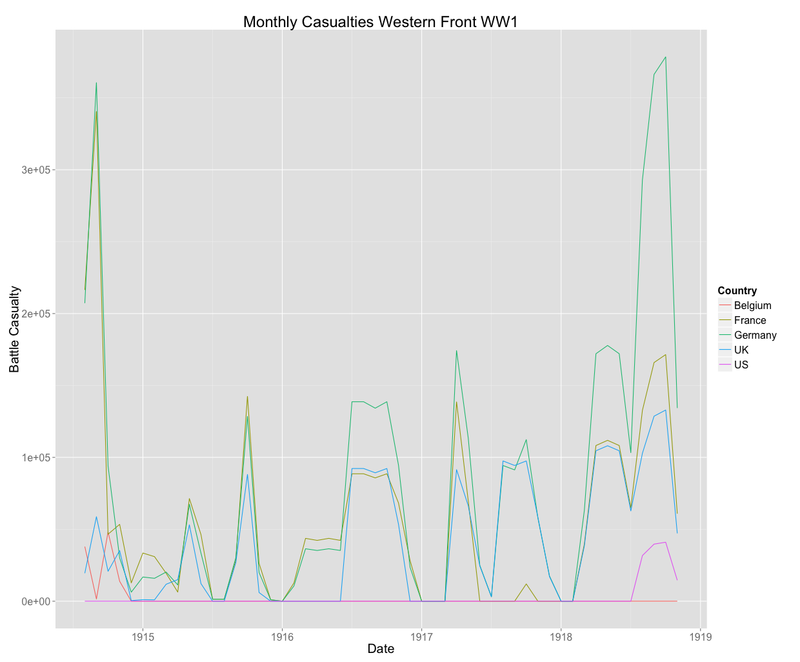 The data includes all major battles in WW1 on Western Front from Wikipedia pages. Since the analysis does not include all battles, the statistics are incomplete. One can see the seasonality of fighting throughout the war. Major operations weren’t planned for winter months. The opening months of the war involved high casualties on both the French and German sides when the front was still fluid. By the end of 1914, the front was established and the next 3 years brought little change to the front. In the beginning of 1918, fresh from victory on the Eastern Front, the Germans went for broke on final offensive to defeat France and England before the US arrived en masse. It failed, and the Germans bowing to the inevitable, started surrendering in large numbers in wake of the the 100 days offensive the allies launched in the latter half of 1918. An armistice went into effect in November 1918 and effectively ended military confrontations for WW1 on Western Front. While the number of US casualties is a fraction of those of all belligerents. 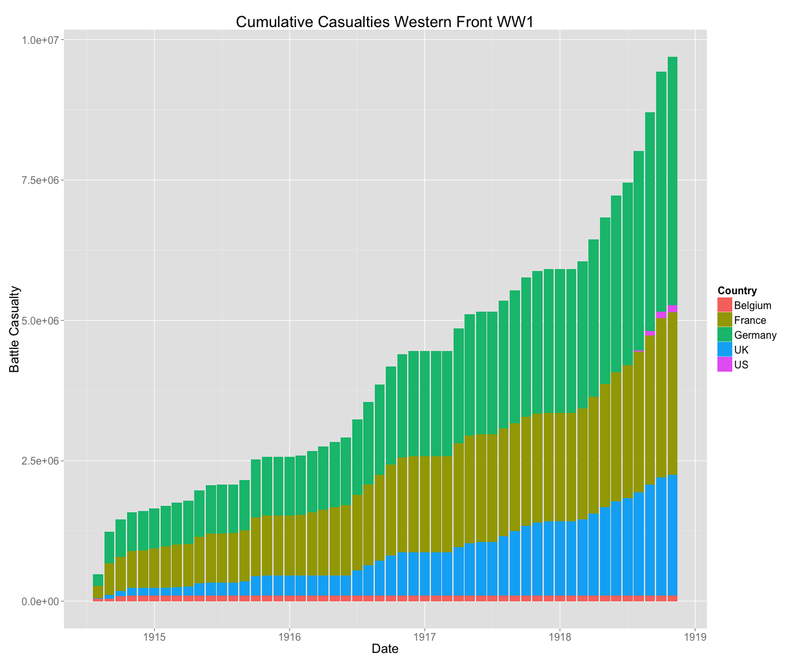 It should be noted that US involvement was far more impactful than the casualty numbers suggest. The Germans didn’t so much as lose WW1 on the field of battle as surrender to the inevitability of American’s far superior men and material (an action which was not repeated in WW2). Each battle has a start date, end date, and casualty figures for respective combatants. There is assumed to be a battle exchange rate coefficient for belligerent j at time t called beta(j,t).This follows a random walk beta(j,t)~normal(beta(j,t-1),sigmabeta(j)). There is also a specific Battle Error Beta for each battle k and country j which is added to beta(i,j). Battle Error Rate Beta is constrained to sum to zero across all battles. The allies were consistently worse fighters than the Germans. This isn’t surprising considering: 1) the Germans were defending more than attacking and 2) they chose the best ground to dig its trenches. Belgium low rates of casualty exchange is due to the surrendering of forts of Liege and Namur. Interesting, England had a worse exchange rate than France. This is possibly due to the fact the English did more night raids than France and expected more from their troops. America had the highest exchange rate, although this might be because the US was only in the latter half of 1918 and was around when the Germans started to surrender, not necessarily because they were better fighters than English or French. The most obvious aspect of this graph shows the relative decline of German fighting power from the end of 1915 to the middle of 1917. I attribute this to Germany relocating much of its troops elsewhere during this period (in Eastern Front and propping up Austria-Hungary’s fighting ability in Italy and Balkans Theater). It’s difficult to tell whether tactics really effected the outcome. The most this analysis has showed was the marked decreased in fighting quality of Germans relative to Allies. The model does assumes independent time error and battle error components among the countries. This is obviously not true. One can see that both time components of France and England are correlated. Likewise, if both England and France fight in same battle, they should be similarly disadvantaged/advantaged. In order to capture these effects, correlated error terms would be necessary.